A Croque Monsieur is one of France's most known snack recipe. The fancy, dressed up cheese toastie is sold not only all over France, but all over the world. It is impossible to not see one on any cafe menu throughout France. However, have you ever wondered what a Croque Madam is? The Croque Madame is simply a traditional Croque Monsieur served with a fried egg and a bit of Béchamel sauce spooned over the finished sandwich. That is a simplistic description for what is a very delicious version of the original. The Bechamel adds creaminess, the egg turns it from a light snack to a substantial dish, and it is so quick and easy. 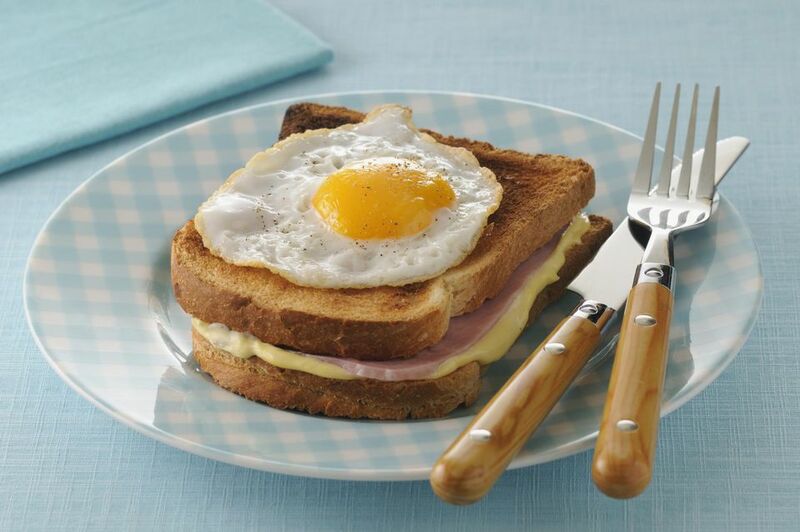 It’s a very easy recipe; if you’ve ever fried an egg for breakfast, you can make this Croque. Place the butter and flour into a saucepan. Place over a medium heat and while stirring constantly, melt the butter and stir in the flour to create a thick paste. Add the milk to the paste and whisk furiously to create a thick paste. If the paste is too thick, add a dash more milk and whisk again. Continue until you have a glossy thick, creamy sauce. Add the salt to taste. Preheat the broiler to the lowest heat setting. Evenly divide and spread the mustard on four slices of bread. Place a few slices of ham, followed by 1/2 cup Gruyere, on the mustard-side of the bread. Cover the cheese with the remaining slices of bread and spread the butter on the outside surfaces of the sandwiches. Preheat a skillet over low heat, ready to fry the eggs Place the sandwiches on an ungreased baking sheet and broil for about 5 minutes, turn them over, cover with the remaining cheese, and continue cooking until they are crispy and golden brown, about five additional minutes. While the sandwiches are broiling, fry the eggs one at a time. Do not over cook the eggs, though; the yolks should remain runny, you can even leave the cooking until the sandwiches are ready as they will be so hot it is fine for them to stand a little while. Serve each hot sandwich with a fried egg and one tablespoon of Béchamel sauce on top. This recipe makes 4 sandwiches. Daube de Boeuf is a Dish Worth Waiting For. You will be glad you did.